It’s springtime and Baby Animal Season is here! Have you ever held a fluffy little chick or nuzzled a tiny bunny? We have a front row seat waiting just for you, where you can see your new furry friends eat and play, while learning more about them from their caretakers.You’ll be able to pet our little Suffolk lambs, little Nubian Kid goats, chicks and more. Ponies are ready to take the first guests of the season for a ride and our trains will let you see the entire Park, with stops for fun and food along the way.If you listen carefully you can hear the tink-tink- tink of the blacksmith in his shop and the tap-tap- tap of the saddle maker fashioning leather goods. 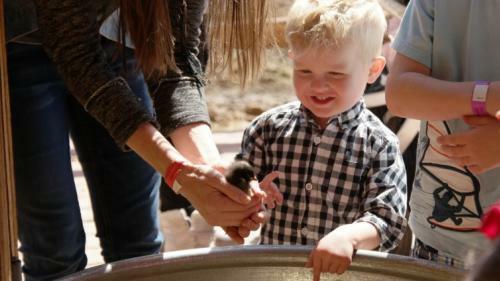 Enjoy games, craft making and many fun activities during Baby Animal Season. When you get hungry follow your nose to the Huntsman Grill where you can get great grub and top off your day with a sweet treat at Brigham’s Donuts. *Sundays: Train tour, static sites, baby animals, and shopping at the Visitor Center available.